Carrie Fisher For anyone who has a child, was a child, or cares about children. 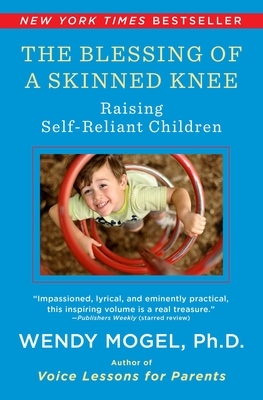 Wendy Mogel teaches you how to raise a child to be a good person and not just raise a child to feel good. Great for the Jewish parent, great for the Presbyterian parent, the Buddhist, and even the skeptic. Rabbi Jeffrey K. Salkin author of Putting God on the Guest List Wendy Mogel presents us with one of the finest and most challenging books on parenting to emerge in recent years. In a firm and loving voice, she reminds parents and all those who care about children of the sanctity of parenting. Her blending of Judaism and parenting wisdom jumps off every page. I love her work -- both as a rabbi and as a father. Reverend Robert Thompson school minister of the Phillips Exeter Academy While reading The Blessing of a Skinned Knee, I felt that I was being tutored by an elder in the ways of the world. As a Christian minister, I have found that our faiths have that relationship to each other. As a parent, I was encouraged in the very ways that our generation of parents is baffled. You have hit on all of the issues that are difficult: materialism, permissiveness, guardianship against the destruction of humane values, and preservation of sacred time and space in a harried, dislocated world. Peter Cobb executive director of the Council for Spiritual and Ethical Education Prophets call on the wisdom of a tradition, its revealed truth, to say out loud what we know but are afraid to utter. Wendy Mogel has issued a prophetic call to good parenting, one laced with psychological insight, practicality, and humor. Her words are themselves a gift of faith and a blessing.